You've no doubt heard about certain foods and beverages that increase your risk for dental disease. These foods, often high in added sugar or acid, can lead to tooth decay or periodontal (gum) disease. But have you heard about foods with the opposite effect — actually protecting your teeth against disease? Many of these dental-friendly foods are plant-based and fibrous: they stimulate saliva production, one of the mouth's best disease-fighting weapons. 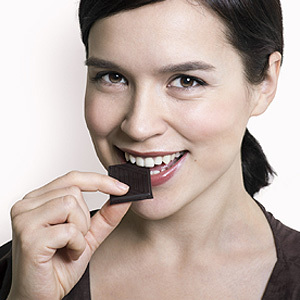 But there are also some foods you might not expect to make the good list for dental health. Here are 3 surprising foods that could help you fight dental disease. Cheese. We've long recognized milk as important to dental health — but cultured dairy products like cheese are also good for teeth. Cheese stimulates saliva, which neutralizes acid and replenishes the enamel's mineral content. Cheese also contains decay-stopping minerals like calcium, phosphorous and casein. And although milk cheese contains the sugar lactose, this particular type triggers less acid production than other sugars. Black & green teas. You may have heard about the staining effect of tea, and avoided it as a result. But both forms of tea are also rich in antioxidants, substances that protect us against disease, including in the mouth. Black tea also contains fluoride, which strengthens enamel against cavities. If you drink tea, of course, you should exercise diligent hygiene to reduce any staining effect. Chocolate. Yes, you read that right, chocolate: unrefined cocoa to be exact, which contains a number of compounds that resist decay. Ah, but there's a catch — chocolate in the form of your favorite candy bar usually contains high amounts of sugar. Sweetened chocolate, then, is a mixed bag of decay-resistive compounds and decay-promoting sugar. To get the benefit you'll have to partake of this favorite food of the Aztecs in a more raw, less sweetened form. Of course, there's no single wonder food that prevents tooth decay. Your best approach is a diet rich in fresh fruits and vegetables, dairy and quality protein while limiting sugar-added and acidic foods.Â And don't forget daily brushing and flossing, coupled with regular dental visits for cleanings and checkups. Having a comprehensive dental care plan will help ensure your teeth remain healthy and disease-free.